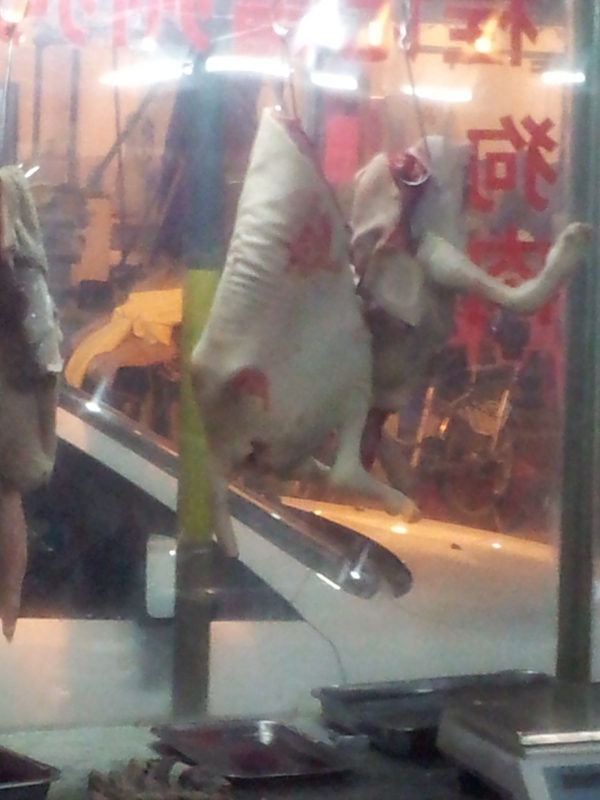 It has long been a stereotype that Chinese people have a taste for dog meat. Being that I was living in the modern city of Shenzhen, I didn’t think that I would have the chance to try it. But after mentioning it to some of my Chinese friends they told Krista and I where we could find it. Being the adventurers eaters that we are, we decided to give it a shot. I was staring at a butchered dog in a vendor’s shop window. Before I left the U.S. I said that I wouldn’t try it, but it’s an opportunity a bit too interesting to miss. Although a bit shocking it was hard not to wonder what it would taste like. While we waited for our friends Krista, Leanne, and I chatted. We didn’t talk about anything in particular; it was pretty much an average night. I was a bit anxious about chowin’ down on Sparky, since I couldn’t shake the fear it would be too good to give up once back in the states. I’m still not really sure what I expected. Waiting on the dog meat, time slowed to a crawl. It wasn’t the only thing we ordered, but it was the main course. Huang gua (spiced cucumber) is good no matter where you go and the peas were good as well. The stewed chicken was tasty, but I couldn’t stop staring at the dog in the window. Aside from it being dog it made me feel a bit weird to eat it when it was hanging in an open window-stall on the sidewalk. I just couldn’t stop looking at the paws. When it finally came we all just looked at it for a moment longer than we usually looked at hotpot. For those of you that don’t know, hotpot is basically a stew in which you can cook as many veggies and meats as you want. 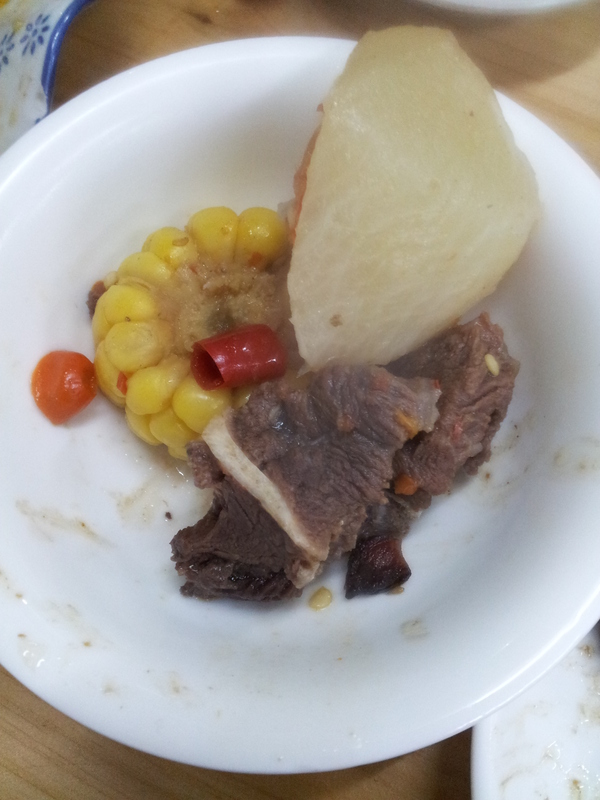 Ours came with the dog meat already at a boil. After getting over the initial surprise we dug in. All but one person (since we were able to convince her that her dog would smell it on her and attack once she got home) had a taste and I’d be lying if I said that it didn’t taste good. It had a very interesting flavor. It was a bit gamey, had a lot of fat and just a hint of pork-like sweetness. The closest thing that I can compare it to is goat, hinted with the sweet tanginess of betrayal. The only bad thing I have to say about our meal was that it was much too spicy. While in China I started to enjoy spicy foods much more than I ever did in the States, but I have my limits and the dog hotpot was pushing them. Although I enjoyed the meat, it was an uphill battle to eat as much as I wanted. I was fit to burst after we finished eating man’s best friend and together we all decided to take a cab back to Shuiwei (my neighborhood in Shenzhen) and have a few beers. While we were in the cab, on the ride home my stomach started getting upset. It was in turmoil and I couldn’t help but wonder if the meat (which remember was on display in the middle of the sidewalk) was making me sick; if my own small reservation about eating dog meat was coming back to haunt me, or if a higher power was punishing me for eating the first domesticated animal companion to mankind. Either way after getting back to Shuiwei I bolted for the bathroom. The meat went down easy, but it definitely came out barking. Afterwards I joined my friends at Juice Baby and enjoyed whatever regularity remained of the night. I thought that eating dog would make me feel something. I still don’t know what exactly, but that’s what I had always assumed. After having it though, it’s really just like any other meat. It’s unique in its own way, but so is pigeon (which is also readily available in China). It’s cool to be able to say that I’ve tried it, but canis familaris doesn’t even make my top five. 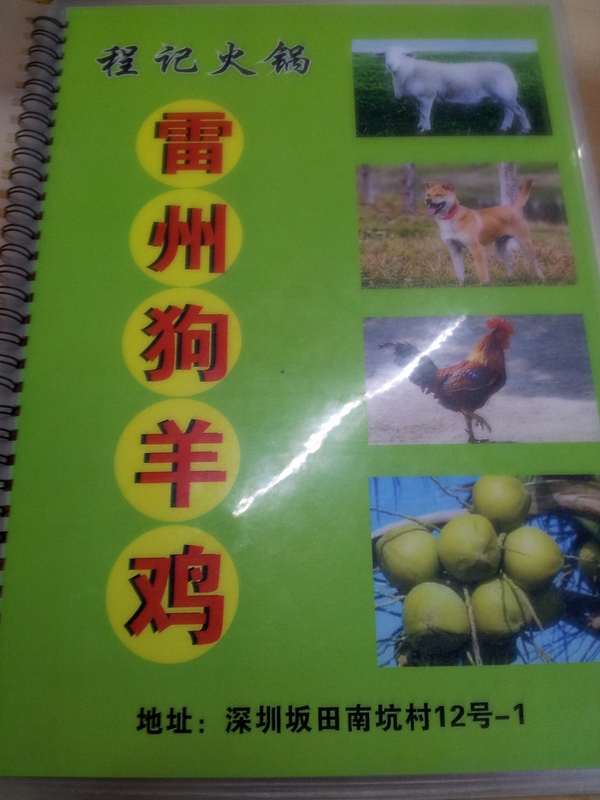 Ironically, many of my Chinese friends have never eaten it. When I told some of them about the experience many looked at me in disgust and others reprimanded me. I found it funny that I, the American, wanted so badly to try it while the natives barely felt comfortable enough to talk about it. The experience goes to show that you really can’t indulge every stereotype.